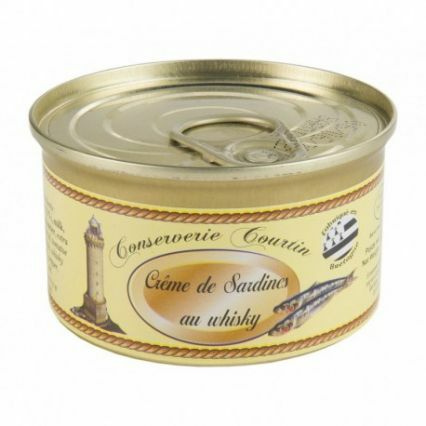 A real delicacy blending the fine taste of sardines with just a hint of whisky! The sardines are delicately prepared with milk, eggs, and fresh butter to give a creamy taste and texture. Dietary Information: Contains milk. Contains eggs. Preservative free. Additive free. Gluten free. Sardines (55%), milk, fresh eggs, butter, extra virgin olive oil, tomato concentrate, whisky (0.16%), pepper, salt. Delicious enjoyed on warm lightly toasted bread or on canapés when entertaining. A drop of fresh lemon or lime juice do not go amiss either! Goes well with a chilled white wine such as a Sancerre.